The Philadelphia Flyers announced that they have signed 6’6”, 214-pound defenseman Chris Pronger to a multi-year contract extension, according to club General Manager Paul Holmgren. Per club policy, financial terms were not disclosed. Pronger, 34, was acquired on June 26 at the 2009 NHL Entry Draft, along with forward Ryan Dingle, from the Anaheim Ducks in exchange for right wing Joffrey Lupul, defenseman Luca Sbisa, the team’s first-round pick (21st overall) in the 2009 NHL Entry Draft, the team’s first round pick in the 2010 NHL Entry Draft, and a conditional third-round draft pick. 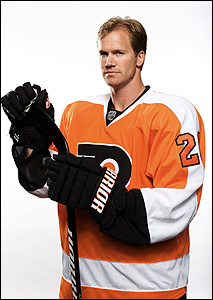 In 2008-09, Pronger recorded 48 points (11G,37A) and 88 penalty minutes in 82 regular season games. He led the Ducks in average time on ice (26:56 – 2nd in NHL) and finished second on Anaheim’s defense in goals (11), assists (37) and points (48). He also posted 10 points (2G,8A) in 13 Stanley Cup Playoff games. Over parts of 15 seasons in the National Hockey League with the Hartford Whalers (1993-1994 to 1994-95), St. Louis Blues (1995-96 to 2003-04), Edmonton Oilers (2005-06) and Anaheim Ducks (2006-07 to 2008-09), Pronger has recorded 142 goals and 464 assists for 606 points and 1,457 penalty minutes in 1,022 regular season games. He has also recorded 22 goals and 80 assists for 102 points and 286 penalty minutes in 147 Stanley Cup Playoff games, including 15 points (3G,12A) in 19 games to help lead the Ducks to the Stanley Cup Championship in 2007. In 2006, Pronger posted 21 points (5G,16A) in 24 playoff games to help lead the Oilers to the Stanley Cup Final. A native of Dryden, Ontario, Pronger won the Hart Memorial Trophy (most valuable player) and James Norris Trophy (best defenseman) in 2000. He has also been named to the NHL All-Rookie Team in 1994, NHL First All-Star Team in 2000, Second NHL All-Star Team three times (1998, 2004, 2007), and participated in the NHL All-Star Game five times (1999, 2000, 2002, 2004, 2008), and was a member of Team Canada in three Winter Olympic Games (1998, 2002, 2006), winning the gold medal in 2002. He was the second overall selection in the 1993 NHL Entry Draft by the Hartford Whalers.